If the sport of football ever dies, it will die from the outside in. It won’t be undone by a labor lockout or a broken business model — football owners know how to make money. Instead, the death will start with those furthest from the paychecks, the unpaid high school athletes playing on Friday nights. It will begin with nervous parents reading about brain trauma, with doctors warning about the physics of soft tissue smashing into hard bone, with coaches forced to bench stars for an entire season because of a single concussion. The stadiums will still be full on Sunday, the professionals will still play, the profits will continue. But the sport will be sick. The sickness will be rooted in football’s tragic flaw, which is that it inflicts concussions on its players with devastating frequency. Although estimates vary, several studies suggest that up to 15 percent of football players suffer a mild traumatic brain injury during the season. (The odds are significantly worse for student athletes — the Centers for Disease Control and Prevention estimates that nearly 2 million brain injuries are suffered by teenage players every year.) In fact, the chances of getting a concussion while playing high school football are approximately three times higher than the second most dangerous sport, which is girls’ soccer. While such head injuries have long been ignored — until recently, players were resuscitated with smelling salts so they could re-enter the game — it’s now clear that these blows have lasting consequences. The consequences appear to be particularly severe for the adolescent brain. According to a study published last year in Neurosurgery, high school football players who suffered two or more concussions reported mental problems at much higher rates, including headaches, dizziness, and sleeping issues. The scientists describe these symptoms as “neural precursors,” warning signs that something in the head has gone seriously wrong. This research builds on previous work documenting the hazards of football for the teenage brain. In 2002, a team of neurologists surveying several hundred high school football players concluded that athletes who had suffered three or more concussions were nearly ten times more likely to exhibit multiple “abnormal” responses to head injury, including loss of consciousness and persistent amnesia. A 2004 study, meanwhile, revealed that football players with multiple concussions were 7.7 times more likely to experience a “major drop in memory performance” and that three months after a concussion they continued to experience “persistent deficits in processing complex visual stimuli.” What’s most disturbing, perhaps, is that these cognitive deficits have a real-world impact: When compared with similar students without a history of concussions, athletes with two or more brain injuries demonstrate statistically significant lower grade-point averages. In recent years, it’s become clear that the severity of a concussion is only indirectly related to the physical force of the impact. Sometimes, players walk away from savage hits. And sometimes they are felled by incidental contact. While data compiled from the Head Impact Telemetry System, or HITS, captures the extreme physical forces at work during a football game — it’s not uncommon for a player to sustain hits equivalent to the impact of a 25 mph car crash — there is no clear threshold for injury. The mind remains a black box; nobody really understands why it breaks. But we do know what happens once it’s broken. In the milliseconds after a concussion, there is a sudden release of neurotransmitters as billions of brain cells turn themselves on at the exact same time. This frenzy of activity leads to a surge of electricity, an unleashing of the charged ions contained within neurons. It’s as if the brain is pouring out its power. The worst part of the concussion, however, is what happens next, as all those cells frantically work to regain their equilibrium. This process takes time, although how long is impossible to predict: sometimes hours, sometimes weeks, sometimes never. (The latest guidelines suggest that most concussed subjects require at least 10 days to recover, with adolescents generally needing a few days more.) While the brain is restoring itself, people suffer from a long list of side effects, which are intended to keep them from thinking too hard. Bright lights are painful; memory is fragile and full of holes; focus is impossible. The healing also has to be uninterrupted. In the aftermath of a traumatic brain injury, the brain remains extremely fragile. Because neurons are still starved for energy, even a minor “secondary impact” can unleash a devastating molecular cascade. All of a sudden, brain cells that seemed to be regaining their balance begin committing suicide. The end result is a massive loss of neurons. Nobody knows why this loss happens. But the loss is permanent. In recent years, neuroscientists have documented the effect of these blows over time. The worst possible outcome is a disease known as chronic traumatic encephalopathy, or CTE.1 Although CTE is often clinically indistinguishable from Alzheimer’s — patients suffer from memory loss, mood disorders, and depression — this degenerative illness has a very different cause. CTE is a disease of violence. It is what happens when the brain is smashed into the skull again and again. How common is CTE among former football players? Nobody knows. 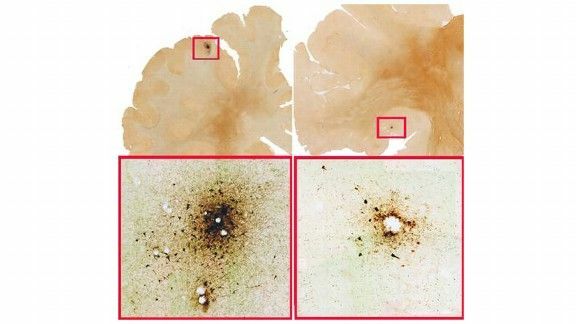 At the moment, CTE can only be diagnosed postmortem, after the cortex is dissected. However, there is disturbing evidence that CTE is occurring among players at rates many times higher than normal. For instance, a 2009 study commissioned by the NFL found that former players between the ages of 30 and 49 were being diagnosed with severe memory-related diseases at approximately nineteen times the rate of the general population. Another disturbing clue comes from the initial results of an autopsy analysis led by Ann McKee at Boston University. Over the last five years, she has autopsied the brains of fifteen former players who suffered from various mental conditions, including memory loss and depression. Fourteen of these players had CTE. Although McKee has only studied a single teenage brain, she found that brain damage was already detectable, with the multiple-concussed 18-year-old football player showing irreversible signs of CTE in parts of the frontal cortex. According to McKee, this is the earliest evidence of CTE ever recorded. Needless to say, this disturbing data has not dissuaded anyone from playing in the NFL: The tremendous rewards offered to professional athletes help compensate for the potential risk. We understand why they play on Sunday. But this same calculus doesn’t apply to high school athletes, that pipeline of future talent. Although these teenagers are suffering concussions at higher rates and with worse consequences — the head trauma of football targets the most vulnerable areas of the developing brain — the overwhelming majority of these kids will never play the sport competitively again. They are getting paid nothing and yet they are paying the highest cost. Can the Sport Be Saved? Because of its national reputation — and extremely well-funded athletic department — Mater Dei has been on the leading edge of concussion prevention and treatment for high school football players. The coaches are vigilant; the equipment is top of the line; the latest medical recommendations are exactingly followed. And yet, even when a football program does everything right, it’s still not clear if it’s enough. This uncertainty haunts the Mater Dei coaching staff, who struggle on a daily basis to effectively manage the risk of concussions among their players. The new research on concussions has allowed them to prevent many of the worst injuries, but it has also made them increasingly aware of the ubiquity of injury. They know better than anyone that if an elite program like Mater Dei can’t solve the problem of head trauma, it seems unlikely the problem can be solved. The sport may simply be too dangerous for teenagers. The Mater Dei coaches deal with the problem of underreporting by insisting that players monitor each other and, if necessary, tell the staff when they suspect a teammate has suffered a concussion. “I’m not going to be able to see every hit,” Fernandez says. “It’s a crowded field with lots of contact. That’s why we make it clear that monitoring concussions is the responsibility of the entire team. If a buddy is out of it and you don’t tell us, then that’s on you.” Although the “team responsibility” approach hasn’t eliminated underreporting, it has reduced it. According to the Mater Dei staff, the varsity team averages three to four concussions a month; the JV squad a few more. The imPACT test also allows the Mater Dei coaches to estimate when a player is ready to return to “contact status.” According to Fernandez, the minimum a concussed player is going to be out is one week, even if their imPACT scores return to normal. Unfortunately, not every high school football program is as strict about secondary impacts as Mater Dei. According to a 2009 survey of 1,308 concussion incidents reported by school trainers, more than 40 percent of athletes return to the field too quickly. What’s worse, the most severe concussions are often ignored: The same survey found that 16 percent of football players who lost consciousness after being hit returned to the field the very same day. This drive to prevent brain injuries has dramatically reshaped football at Mater Dei. The first thing that changed was practice. There’s a scene in the pilot of Friday Night Lights in which a hungover Tim Riggins is battered relentlessly during warmups, repeatedly exposed to helmet-on-helmet collisions. That would never happen now. When people talk about concussions in football, it doesn’t take long before they start talking about helmets. There is an unmistakable optimism to such conversations, a persistent hope that technology will somehow save the sport. Nobody knows what this technology will be — a harder plastic cap, a softer foam, a better chin strap — but everybody knows what it will do: keep the brain from slamming into its shell. The violence will continue, but the carnage will stop, because players will finally be protected from head trauma. This faith is rooted in history. In the 1960s, the sport of football faced a similar crisis, as dozens of high school players were dying every year of skull fractures. These deaths led to the formation of NOCSAE, an agency in charge of establishing guidelines for athletic equipment. In 1973, NOCSAE issued their first football helmet requirements, insisting that every helmet had to buffer the skull from the impact of a 60-inch free fall. The standard worked, helping to reduce head-injury fatalities in high school football by 74 percent. But here’s the bad news: These old regulations provide scant protection against concussions. While a hard plastic helmet lined with cushioning can protect the skull from fracturing, a concussion occurs on the inside of the head, when the brain quickly decelerates and impacts bone. This means that helmet designers face an inevitable tradeoff: If the head isn’t shielded from the strongest physical impacts — and this is best done with soft, pliable materials — then it can break and bleed. But the very act of protecting players from those severe collisions means that the head will bounce around the cushioned helmet, thus allowing the brain to move within its bony cage. The worst impact will be internal. It is extremely unlikely that helmets can prevent concussions the way they prevent skull fractures.” He went on to criticize numerous claims by helmet manufacturers suggesting otherwise, noting that even Riddell’s specialized anti-concussion helmet has only been shown to reduce the rate of concussions by 2.6 percent. While a hard plastic helmet lined with cushioning can protect the skull from fracturing, a concussion occurs on the inside of the head, when the brain quickly decelerates and impacts bone. But even if a better helmet were technically possible, and even if the high school players were forced to use it properly, it’s still unclear whether it would significantly reduce the risk of concussions. That’s because people typically react to improved safety gear by increasing the riskiness of their behavior, a peculiar phenomenon known as the risk compensation effect. Consider the long-term impact of antilock brakes. While the technology should make cars much safer to drive — the computerized system automatically controls the speed of each tire, helping to prevent uncontrolled skids — it has not resulted in any measurable improvement in road safety. Why not? Numerous studies have demonstrated that drivers with antilock braking systems drive faster and brake later. A similar pattern has been observed for ski helmets — skiers wearing the protective gear ride more difficult courses, which is why ski deaths have not fallen — and skydiving equipment, which has become much more reliable without reducing fatalities. (Divers now open the parachute closer to the ground.) The frustrating lesson of the risk compensation effect is simple: When people feel safer, they take more chances. As a result, the total level of safety remains constant. If the sport of football ever dies, it will die from the outside in. The only question now is whether the death has begun. Jonah Lehrer is a contributing editor at Wired and the author of How We Decide. For decades, this disorder was only associated with former boxers — its original name was “dementia pugilistica,” or “punch drunk” disease. The school retains a strong Catholic identity. There are religious reminders everywhere: little sculptures of Jesus in the doorway, triptychs of saints in the hallway, holy slogans in the weight room. God will determine the outcome. He suffered for your sins. Jesus! Mater Dei uses the Riddell Revolution Speed, which features inflatable pads.